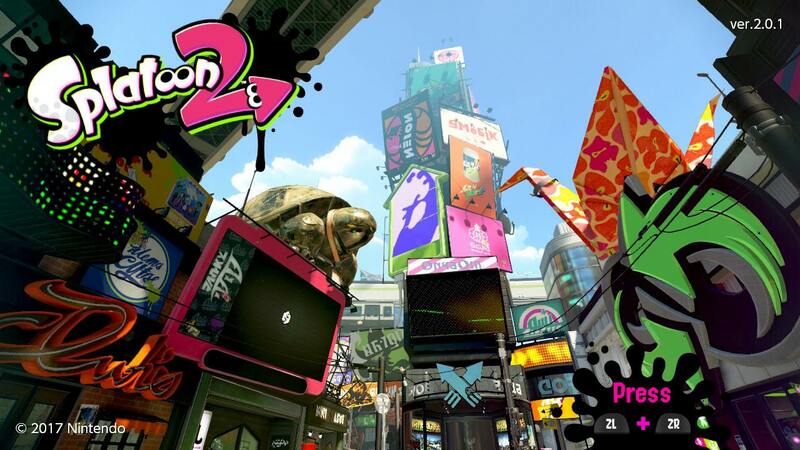 Splatoon 2 is the latest entry in the fresh, young Nintendo franchise introduced on the Wii U. The first entry sold very well, and so Nintendo strengthened their launch year lineup of the Switch, Splatoon 2. 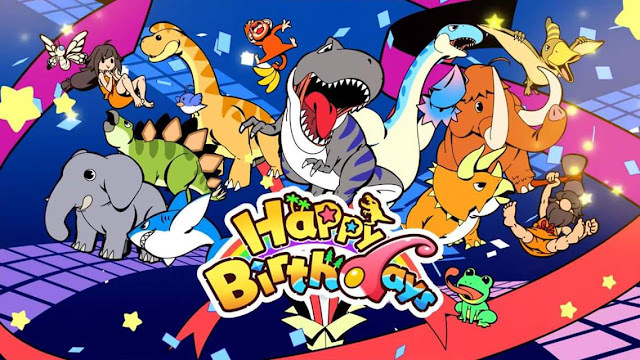 From the moment of the reveal, it has been widely debated about whether this game was a port with some expansion packs built in, or if it was truly a new game. With an all new single player campaign, tons of new gear, and some extra game modes, Nintendo made it quite clear that this was a true sequel. While many reviews will focus on contrasting and comparing the first and second games, I won't be doing that. I am being direct in saying that I have never played the first one, and only had a passing interest in it to begin with. As I noted in my post from yesterday, the Splatoon Global Testfire Weekends convinced me that this was a game for me. 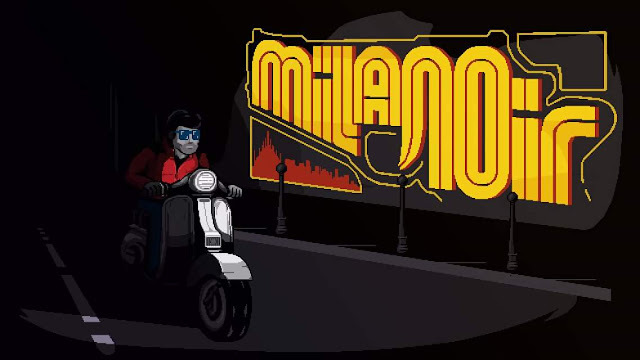 While I was already committed to buying the game for my daughters to play, If it wasn't for that fact, I may not have even tried the game on the Testfire at all until I decided to begin writing this series of reviews. I'm glad that I did check it out, though, as I have had quite a bit of fun playing Splatoon 2 single player and online. First up, we'll touch upon the single player campaign. After being introduced to Inkopolis and the world of Splatoon 2 by our hosts Marina and Pearl, we notice a certain errant pop star pop into one of the drains towards the back of the plaza. We can choose to follow her, or just ignore her and go about the rest of the game. Interacting with the other players via sketched word balloons that somewhat emulates a scaled down Miiverse, visiting the shops to try on new clothes and try out new weapons that can all be purchased with in-game currency. However, if we choose to follow her (Marie), she reveals to us that Callie and the Great Zapfish have gone missing, and she would like you to find and recover them. You proceed through Octo Canyon, completing levels by shooting, jumping, and solving a few puzzles here and there. 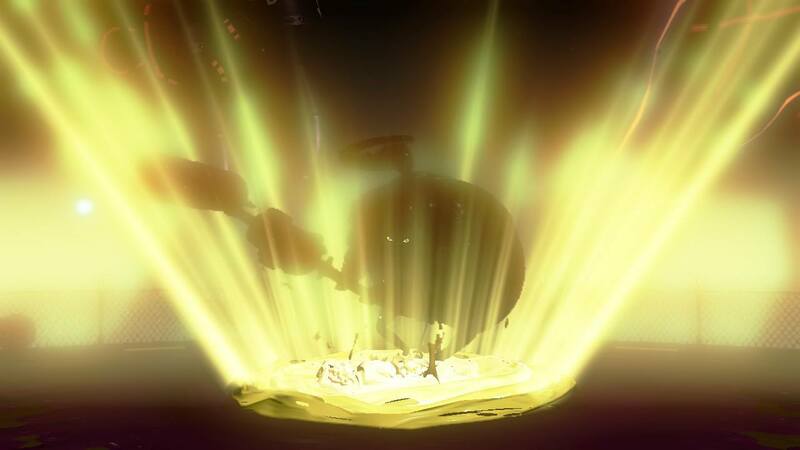 There are a couple of boss battles that take place throughout, and they are fun, but nothing to write home about. The story mode is very much like those I mentioned before, as it is obvious that the story mode was more of an afterthought than the focus of the game. Which is fine, because almost everyone that bought Splatoon 2 did so to play online, and honestly I fell into that category, myself. It's also been a very entertaining jouirney for my tween daughter, and so Nintendo hit it pretty well with their younger audience demographic. I was disappointed that there wasn't local split screen multiplayer, but at least there is the option to play local multiplayer with other Switch users. My daughters were also excited about the prospect of playing together at the same time, but they've just relegated themselves to the old trick of taking turns in online matches. Let's touch on the basic gameplay and features before we discuss online modes. Controls are perfectly tuned, and take very little getting used to. The gyroscopic motion controls will of course vary from person to person, but I found that while I love the accuracy that they can provide while playing matches, motion controls turned on while you're navigating Inkopolis itself is dizzying before you realize why you're camera is whipping around like crazy, and annoying to hold the controller in the proper position to look forward once you kind of get use to it. As a result of this disorienting experience, I usually just turn motion controls off, and leave them that way. I've talked to many that prefer them, and my daughters do, as well. The game features lots of options for customization of gear, that includes hats, shirts, and shoes. Each of these items have their own default abilities and appearances, and different color options. In addition, they have slots for upgradable abilities that you can unlock, assign, and level up as you play. I'm not going to go too in-depth about these options, but it goes without saying that these abilities allow you to customize your inkling to your own play styles, and a recent update allows you to swap load outs in between matches to better suit the play style you wish to use the next time around. These abilities and alternate load-outs are just part and parcel for inline shooters, but I really like the options it opens up in comparison to some other games in the genre. It's a little thing, but it enhances the game greatly for me. You can choose to simply move forward and cover as much turf as possible, go on the defensive, splat opponents, or a mix of these. There are a wide range of weapons that you can utilize for these different strategies, and all of them have their strengths and weaknesses. While you're playing, you'll gain experience points based upon your performance in the match, and leveling up gives you access to new gear, and eventually unlocks ranked mode for the competitive set. I am not in that set. Which means that I won't even talk about ranked mode. There is also a Salmon Run mode that is a horde mode You and three teammates work together as private contractors recovering salmon eggs from spawn points while fighting off waves of enemies. Ememies, of course, being subjective because the game paints this job as being of questionable legality, so it seems that you're harvesting the young of a semi-sentient species while they try to stop you. This mode's only drawback is that to play it alone, you can only do so in a limited time frame that seems to pop up at random. This falls into one of the only complaints I still see pop up about the game- which is that certain elements are limited. In turf war, you only have two courses available at any given time. 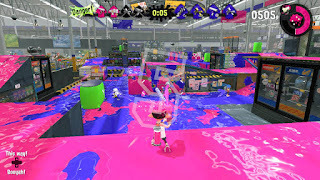 These two arrangements have advantages and disadvantages for competitive and casual players alike, which is a nice way of trying to bring balance to the online world that will be populated by dedicated splatters, newcomers, and people like me that like to drop into a match here and there for short bursts. Overall, though, Nintendo has provided us with another great franchise that is sure to stay fresh for it's community for a long while, yet. 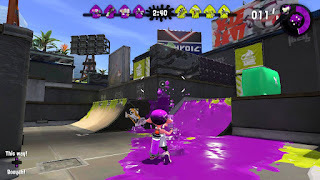 Anther occasional event are Splatfests, which give you the choice between two different objects or concepts, and then forces us to settle it on the ink field.